This week, CBLDF joined the other sponsoring members of the Kids’ Right to Read Project to support students’ and teachers’ free expression rights in two separate but similar cases that would restrict the right to read. 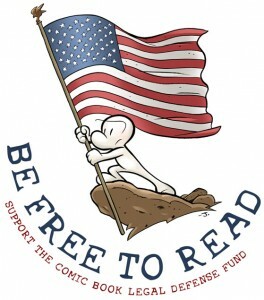 CBLDF joins coalition efforts like these to protect the freedom to read comics. Censorship manifests in many ways, and the unique visual nature of comics makes them more prone to censorship than other types of books. Taking an active stand against all instances of censorship curbs precedent that could adversely affect the rights upon which comics readers depend. Recent news reports tell of efforts to ban or restrict books like The Diary of Anne Frank, Persepolis, The Invisible Man, The Family Book,and The Dirty Cowboy – to name only a few – because someone considered something in them insensitive or offensive. To others, however, the same books are deeply instructive and meaningful. To best educate students and prepare them to function effectively in the community, they must be exposed to a wide variety of ideas, including some that may make them feel uncomfortable at times. If teachers are required to flag books with certain content, they will almost certainly steer clear of any books that might raise eyebrows, and students’ education will suffer. Read the entirety of the letter signed by CBLDF below. In the other case, KRRP urges the Virginia Board of Education to reject an amendment that would require public schools in the state to notify parents about any “sensitive or sexually explicit materials” covered in classes. The proposal grew out of a Fairfax County parent’s 2013 challenge to Toni Morrison’s Beloved, which is used in college-level AP English classes. The amendment does not define what would be considered “sensitive,” and as in the Pennsylvania, case it places the burden on teachers to decide what may be offensive to each student and parent. Read KRRP’s letter to the Virginia BOE below. Please help support CBLDF’s important First Amendment work and reporting on issues such as this by making a donation or becoming a member of CBLDF!